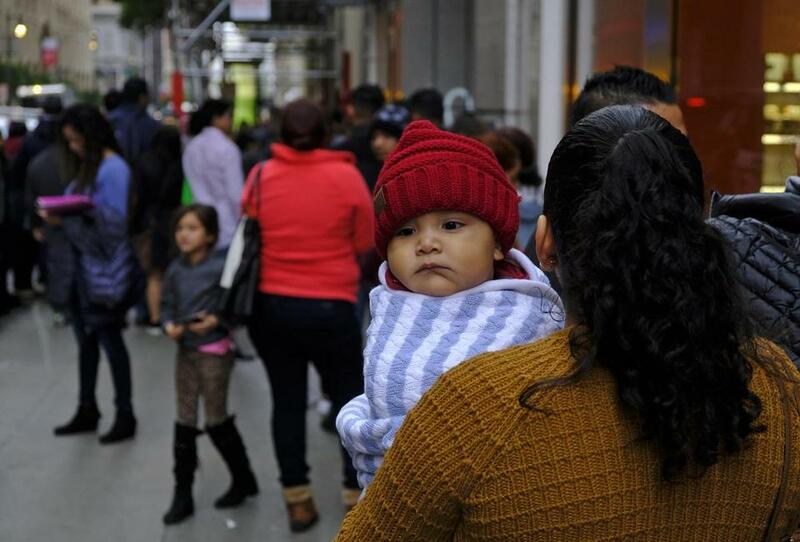 A woman held a child in a line that snaked around the block outside a US immigration office in San Francisco on Jan 31. The crowd was mixed with people who had court appointments and people whose appointments were swallowed up by shutdown. The Salvadoran mother had waited six years for the January hearing. She had entered the country illegally, but had a strong case for a reprieve from deportation, her lawyer believed. A gas station manager living in Lynn, she could prove she had lived in the United States for at least a decade, had not broken any other laws, and that her deportation would present an unusual hardship to her teenage son, an American citizen who lived with her and her husband in a house she helped pay for. If she were removed from the country, her family would likely become homeless, her lawyer, Javier Pico, intended to argue. But she never got the chance to make her case — because of the partial government shutdown. An estimated 86,000 immigrants had their hearings canceled as a result of the 35-day shutdown that began on Dec. 22, according to the Transactional Records Access Clearinghouse, a research group at Syracuse University that tracks federal immigration figures. Massachusetts, which already had a backlog of more than 28,000 cases, was among the states most acutely affected by the shutdown. Nearly 4,000 hearings had been scheduled in Massachusetts’ immigration court during the shutdown, according to the research group. The shutdown brought the immigration courts to a standstill and deepened an already enormous backlog of cases. Some immigrants had waited for years, and now may have to wait years more. Other immigrants whose cases in Massachusetts were canceled, according to their lawyers, include a 27-year-old Russian who was seeking asylum because he is gay and worried about the growing homophobia in his home country; a Mexican national who wanted to return to his native country but needed a judge’s approval so he could maximize his chances of returning to the United States legally; and a 23-year-old Salvadoran woman who had hoped to win asylum status for a better chance to bring her husband back to the United States. That woman, who has a toddler, is seeking refuge from the man who raped and threatened to kill her in El Salvador, her lawyer, Kerry Doyle, said. Her husband, who is the father of her daughter, has been threatened by gangs trying to seize his family’s land in El Salvador, Doyle said. The woman’s hearing had been scheduled for Jan. 2. The government reopened in late January, but could close again in mid-February if President Trump and Congress don’t come to an agreement. Immigration lawyers and judges alike say they are fearful that a second shutdown would paralyze an already overwhelmed system. Not only were strong immigration cases pushed back indefinitely, but cases of unauthorized immigrants who should be deported were also delayed, said Amiena Khan, a New York immigration judge and executive vice president of the National Association of Immigration Judges, the union that represents the judges. After the shutdown, court staff returned from their furloughs to find stacks of unopened mail and new cases and motions on their desks. Lawyers are now bringing extra copies of their cases for judges and prosecutors, in case clerks have been too harried to hand out their own. Attorneys with especially vulnerable clients are asking judges if they can switch hearing dates scheduled for clients with less urgent cases, and are taking to Facebook in search of lawyers who might be willing to swap hearing dates. Unlike the federal judiciary, which is independent and was able to remain open throughout the shutdown, immigration courts fall under the Executive Office for Immigration Review in the Department of Justice, an executive office which was largely closed during the shutdown. John Martin, an office spokesman, said there were 800,000 pending immigration cases nationally as of December, a 50 percent increase since the 2016 fiscal year. The jump is the result of more asylum applications and new cases filed by the Department of Homeland Security, which prosecutes immigration cases, Martin said. Martin said the agency has 409 immigration judges nationwide and is planning to add 50 more in the first half of 2019. More support staff is being hired and courts are increasingly relying on video conferencing. “These efforts are showing results,” said Martin. The number of closed cases rose 20 percent in fiscal year 2018, he said. Khan said the backlog, which long precedes the Trump administration, is largely the result of a court system that operates under an agency that imposes its priorities on judges and has historically given them scant resources. Immigration courts should be independent so that judges could make their own decisions about what cases to prioritize, Khan said. It would “take significant resources to create an agency separate from an executive branch Cabinet office,” he said. Pico’s client, meanwhile, has been taking antidepressants as her case is delayed. Once her son turns 21, she will no longer be able to argue that her deportation would result in an extreme hardship for him, which will severely weaken her case, Pico said.